How do high-altitude residents and deep-water divers thrive where others cannot? UBC Professor Phil Ainslie’s research has taken him from extreme mountain peaks, to the wild edges of the globe and to the cold depths of the ocean. His quest is to understand why and how some thrive in conditions that make the average person extremely ill.
A Canada Research Chair in Cerebrovascular Physiology in Health and Disease, Ainslie has spent his career studying hypoxia—reductions in oxygen tension, content (hemoglobin) or both. When the brain and other organs are deprived of oxygen or blood, a person may become ill, suffer permanent damage or even die. Understanding the physiology and genetics of human hypoxia tolerance has important medical implications, says Ainslie, a professor in the School of Health and Exercise Sciences. 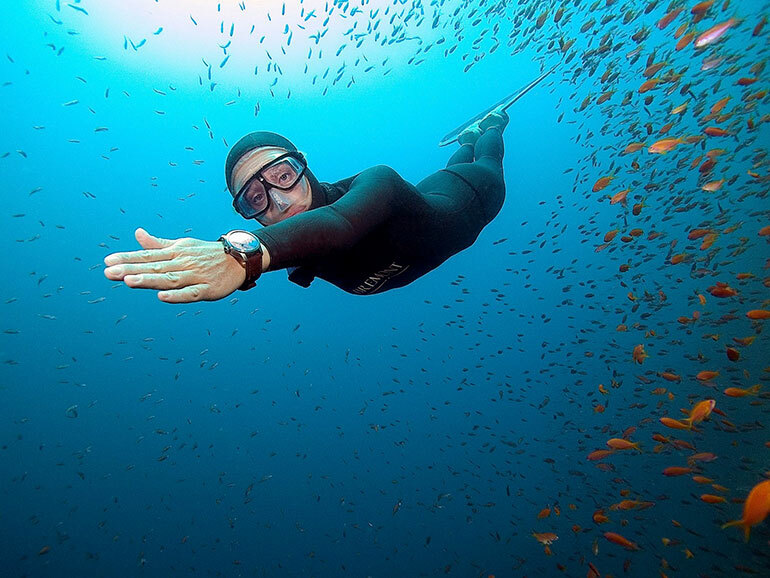 While working with some of the world’s best free divers based in the Mediterranean, Ainslie’s team explored how their lungs, hearts and brains respond to extreme reductions in oxygen tension, and how they were able to train their bodies to withstand such pressures. In a study published this spring in Experimental Physiology, his team outlined the relevant physical characteristics and mechanisms that make extreme breath-holds possible for people participating in competitive apnoea. Ainslie states a better understanding of these factors during seemingly insurmountable voluntary breath-hold situations is relevant for many reasons including a safety and medical point of view. The eventual goal of Ainslie’s globetrotting is to understand how some populations can adapt (or maladapt) to their natural habitat, with the aim of coming up with new methods for prevention and treatment of such illnesses. 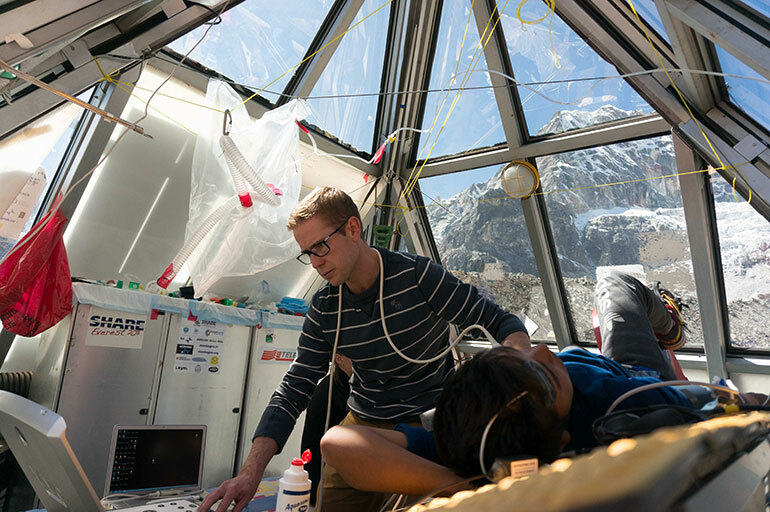 Conducting research at different altitudes, and on people who have lived at high altitude their entire lives, has led Ainslie and his team to more than 100 research publications related to medicine and physiology. Over the past 15 years, Ainslie and his international team of researchers have travelled to the Himalayas numerous times to study the high altitude-adapted Sherpa population. Research has also taken place at White Mountain, California, and Croatia with free-hold divers. The team is now about to embark on a trip to Peru. UBC Okanagan PhD candidate Mike Tymko, is organizing the large-scale Peru expedition. While there, the team of more than 45 co-investigators will spend a month at Cerro de Pasco, a mining town at 4,330 metres. Along with several high-altitude studies that will be conducted on native low-landers, they will also work with a group of Andeans who have developed a genetic mutation and live at high altitude with a condition called chronic mountain sickness. One of the main goals of the trip to Peru is to learn more about this maladaptation and explore potential treatment avenues that might keep the Andeans at work in a healthier manner. They will conduct 15 research projects involving several different stressors, including pharmacological and exercise interventions. The international research team represents universities in Canada, United States, New Zealand, Austria, United Kingdom and Peru, and includes world experts in high-altitude physiology and medicine. Cardiff University’s Mike Stembridge—who has participated on several research trips with Ainslie and Tymkoin Croatia and White Mountain in California, and twice in Nepal—is also heading to Peru with the team. 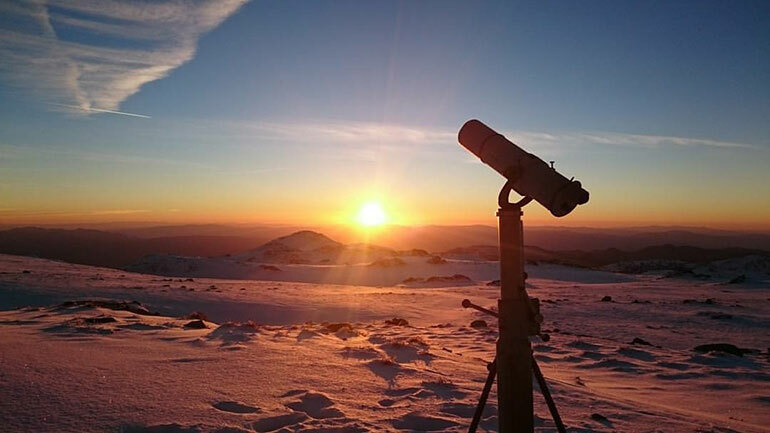 This week, he published a study from research conducted at high altitude at White Mountain. The study, published in the Journal of Physiology, unearthed why the human heart does not function as well at high altitude. The researchers determined a combination of the decrease in the volume of blood circulating around the body, and an increase in blood pressure in the lungs, limit the volume of blood the heart can eject. Stembridge says it’s important to note that neither of these factors affect a person’s ability to perform maximal exercise. After Peru, the team will begin to plan their next expedition—this time to Ethiopia to study a group of highlanders who live at about 3,600 metres. Again, they want to examine the physiological and genetic make-up of people who continue to thrive at an altitude that makes most people ill. Forever curious, Ainslie admits his search for answers and treatment options will continue to take him to the edges of the Earth. Mike Stembridge conducting tests at Everest’s Pyramid Lab.